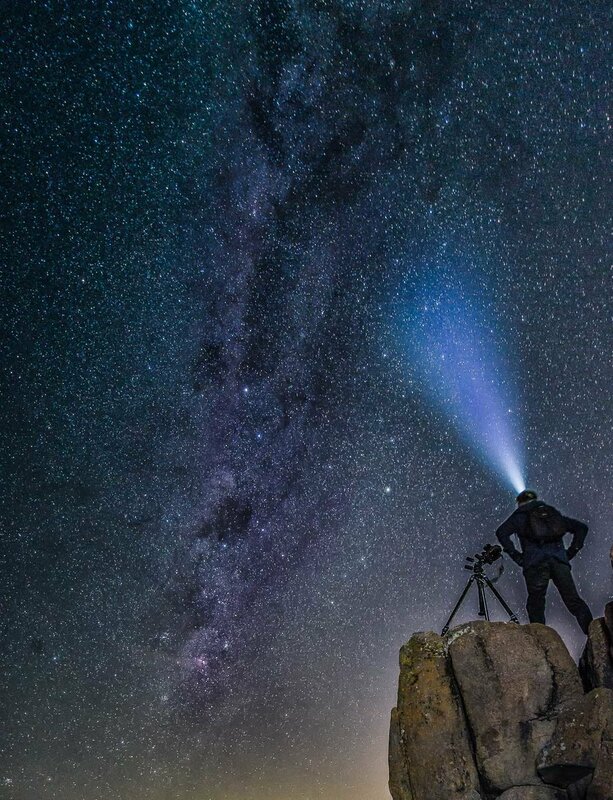 Want to capture beautiful images of the night sky? Alfonso Calero has six great tips to help you shoot for the stars. While you may be tempted to start shooting as soon as the sun goes down it's best to wait until the warm glow of twilight has completely faded. Generally speaking, you'll get the best clarity and contrast if you wait at least two hours after sunset and stop shooting two hours before dawn. Winter is the best time to shoot the night sky in the Southern Hemisphere, as the air is cleaner and clearer and the stars appear brighter. Shooting while there is a quarter, half or full moon will introduce unwanted light to your images and make the stars appear fainter. Aim for a clear moonless night. Light pollution is the number one enemy of star gazing, so seek out a location well away from cities and towns.There are a number of tools you can use to work out where the stars will be at a certain location and time. Stellarium (available for iOS and Android devices) shows an accurate 3D map of the night sky, based on the time you set, your GPS location and the orientation of the phone. To find a specific star or constellation it's simply a matter of setting the date and time and panning the camera around until you see the stars you want to shoot. You'll find it helps to plan your composition before the sun goes down so can see what's happening around you. Try to include a foreground element in the shot such as a tree, mountain, historic home or bush track. Shots of stars by themselves can be interesting but if you can include other elements it's likely you will hold people's interest for longer. To add a dynamic feel to your photos, it's generally a good idea to avoid putting the horizon in the middle of the frame. Most images work better with the horizon placed on a third or quarter line. You don't need a lot of expensive gear to photograph stars but there are a few essentials. First up, you'll need a camera that allows you to shoot at slow shutter speeds – at least 30 seconds and preferably longer. Most DSLRs and high-end compact cameras offer good shutter-speed control with a 'Bulb' (B) mode that basically keeps the shutter open for as long as the shutter button is pressed. A bulb mode is required to capture star trails, which are commonly photographed over several hours. To keep your shots steady, you'll need a sturdy tripod and a remote release. Better than a simple cable or remote release, a programmable intervalometer allows you to shoot time-lapse sequences and program exposures longer than 30 seconds in Bulb (B) mode. If you're using a DSLR, check to see if your camera has a mirror lock-up option. This prevents the small vibrations that reverberate through the camera when the mirror slaps up and down. You can use any lens for night photography but fast, wide angle lenses (16-24mm, 35mm equivalent) are the most popular. 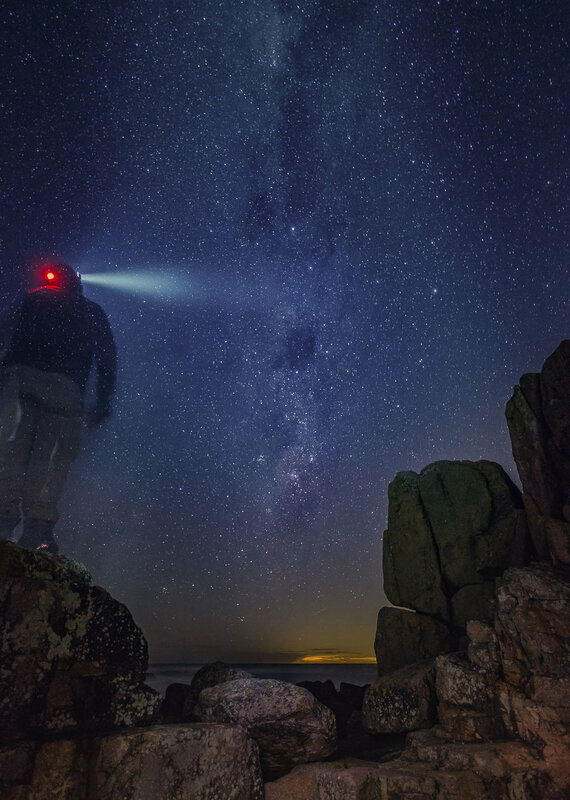 A good headlamp will keep you from tripping over in the dark and help you see what you're doing while keeping both your hands free to operate the camera. I also recommend a strong LED torch to 'paint in' foreground details like trees and rocks. (For some great examples of what you can do with 'torch painting', take a look at Sydney-based photographer Peter Solness' work. Set your camera to manual exposure and take your time working through the settings. 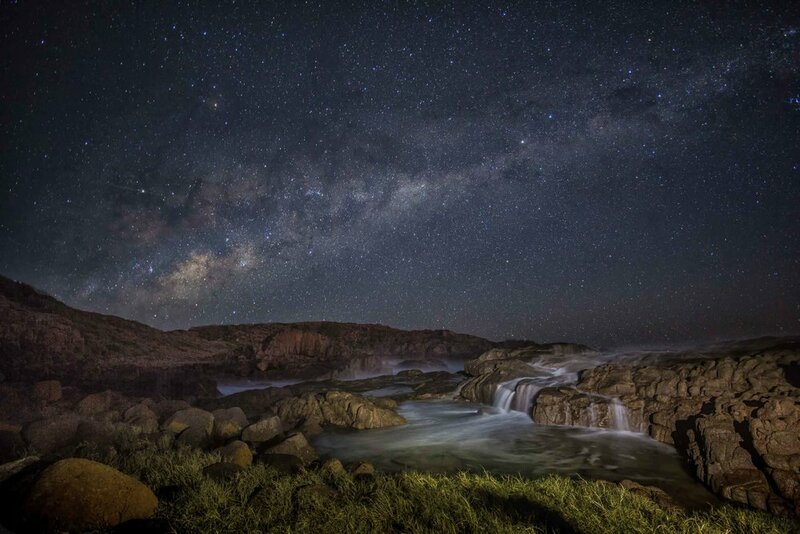 If you are photographing the Milky Way, start with a shutter speed of 30 seconds, aperture of f/2.8 and ISO of 3200. Check the results on the camera's LCD – zoom in to check sharpness and noise – and adjust the settings as required. If there is any evidence of star trails you will need to choose a faster shutter speed to obtain a sharper image. You'll probably find that autofocus is a lost cause at night so switch to manual focus and take your time. I find that Live View offers the most accurate focussing, especially if you can zoom in on the LCD to fine-tune your setting. If you are focussing on a subject in the foreground, use your torch to light up the point you want to focus on. Shoot a test shot and check the focus in review before you proceed. Finally, if your camera allows it, shoot in RAW mode. RAW files contain more data than JPEG files and thus allow more flexibility when it comes to adjust white balance, exposure, contrast, noise and sharpness. If your images are well exposed and focused, you shouldn't have to do too much in post production. If you are using a program like Lightroom, you'll find that small changes to contrast and white balance can make a big difference to the overall impact of the photo. Noise is an issue with night photography as most shots are taken at high ISOs. Zoom in on the image and use the Noise Reduction sliders to clean up the image. One of the challenges with night photography is creating images where both the sky and foreground are well exposed. One option that can be useful is to shoot two images; one exposed for the sky the other for the foreground. As long as the camera doesn't move between shots, it is a relatively easy task to merge the images together in a program like Photoshop.